a Laguna Blue and keep the tan interior. I always thought that would have been a great combination. I am just not sure how the bronze windows would look with the blue. Maybe that's one of the reasons Subaru hesitated on offering it. I am just not sure how the bronze windows would look with the blue. That would be my hestitation as well. However, if the windows are tinted black or silver, the car would look great! The bronze window tint is subtle and best seen when two SVXs with different tints are next to each other. This was a pic I took at a mini SVX meet at newsvx's place last summer. 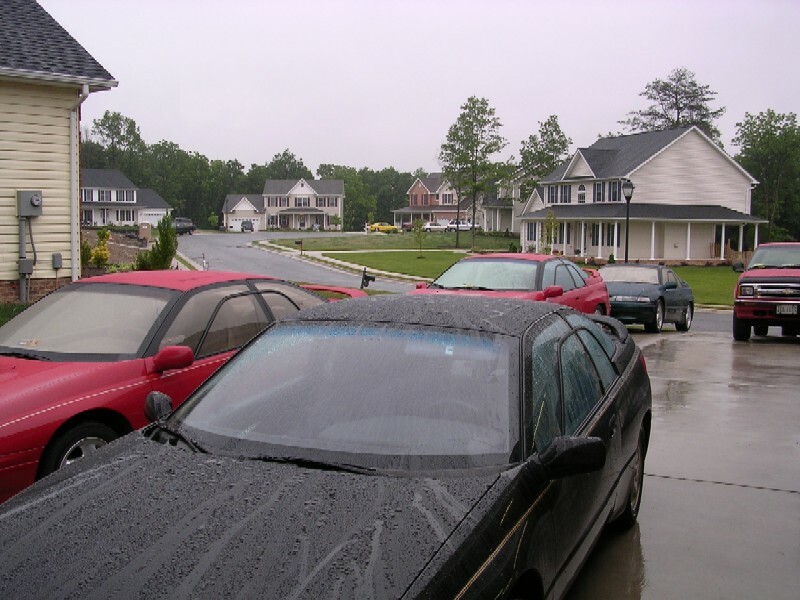 His red '97 LSi is infront of my red '96L, while svxcess's polo green '96 LSi is directly behind mine (Ron Mummert's ebony '92 LS-L is the other car). As you can see in the pic, both SVXs of newsvx and svxcess which have a tan leather interior, have a bronze tint to their glass. The glass on both Ron Mummert's and my car is more silver in tint. I can realy see the difference on my car the drives side rear windows is gold and all of the rest are blue. I agree. I think blue and tan would go togeather just fine. Dayle, since the car's already black, you should go black over blue, that would look sweet! On my Laguna Blue, I would prefer if the roof was black much like the early SVXs. I didn't like how the trunk and other rear trim was also black during those years, but I thought the black roof looked very nice. This seems like an opportunity to do that. If I ever repaint mine, I'm going to the ends of the world to find a black paint for my roof that looks as much like the window glass as possible. I'm not one for tan interiors any way you cut it, but tan on black is the lesser of all the evil combinations. For that reason, I'm torn. Blue is beautiful, but with a tan interior, I'd stick with black. A black interior on the other hand; that would be delicious with any color. Now that car looks very very familiar!! Laguna over tan...sorry not for me. Ill get some pics of it today if she stops by.